Random Shut down in Windows 10 is nothing abnormal due to many causes. Most of them probably can be traced to software issues. With Windows 10, the OS takes the initiative to update itself without waiting for the end user to give the go ahead. It appears as if it is in a constant state of flux. When we faced random shut down in one of our computers, we assumed at first that it is a case of Windows’ exuberance. One of our main computers is getting long in the tooth. It runs Intel Quad Core i5-760 Processor @ 3.33 GHz mated to Intel Tom Cove DH55TC Mother board. It runs quietly sitting in one corner and its OS is Windows 10 Pro version 1709. After the system updated to the Fall Creators update, the system crashed at random. We know for sure, it was not due to any new found love for any virus or Malware as the system was locked down with multiple check points. It turned out that the CPU was inching dangerously close to the 90 degree C whenever a runaway Windows process forced itself to run. Earlier it used to run Windows 7 and it never gave any complaint until it was updated to Windows 10. 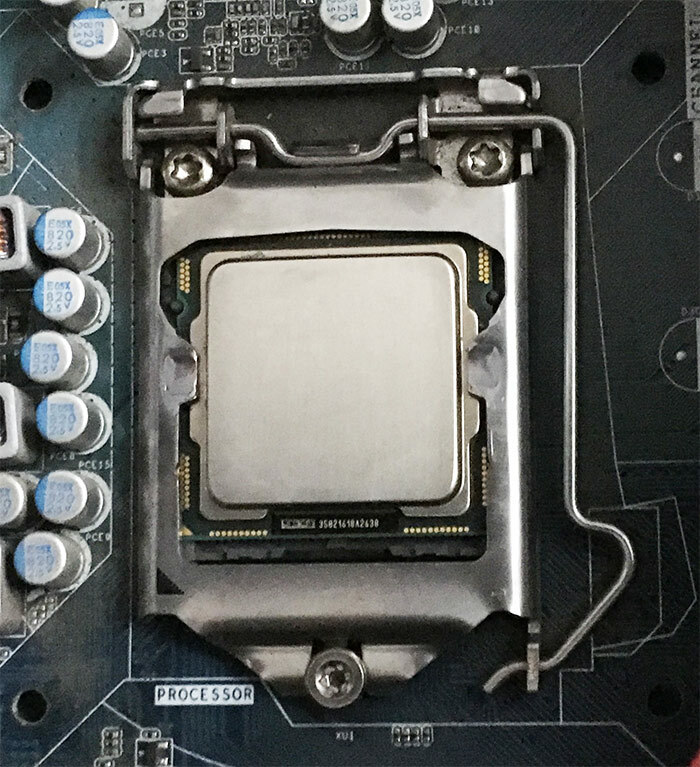 The Intel CPU cooler depended on the push pins to keep the cooler – the aluminum heatsink fitted with a fan, in close contact with the CPU. If you don’t over load the CPU and make conscious effort to keep the CPU usage to less than 50 %, you may not realize that something is amiss. It is possible that you may encounter an occasional shut down but then it is not anything unusual in Windows. Once Windows decided that it will install updates on its own, the occasional unexplained shut downs became frequent until it landed in my desk. 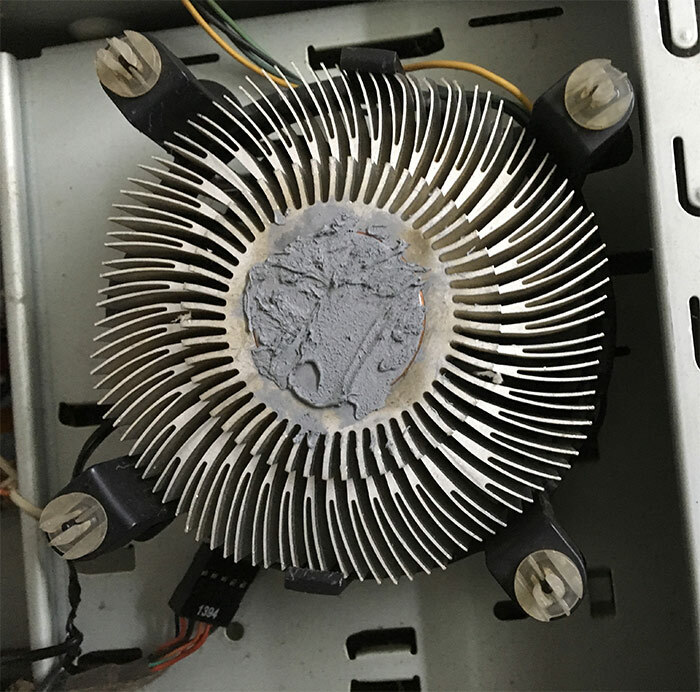 We attended to the usual suspects – dust inside the tower case, checked the fans in and around the case and of course the CPU fan. The routing of the cables in the near vicinity of the CPU was reworked. All these produced zero results. The temperature continued to rise in direct proportion to the CPU usage. 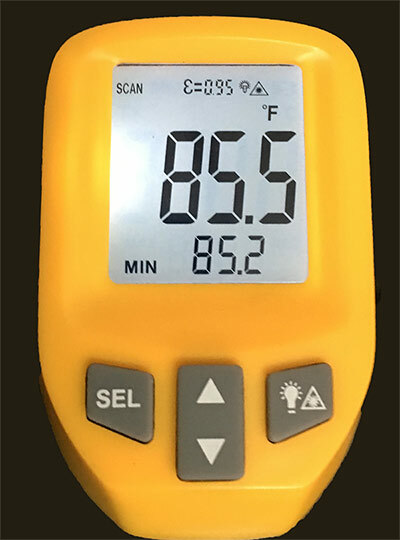 In normal computers, the temperature will reach its working temperature and maintain a range not exceeding 80 Degree C (176 degree F) even under severe load. 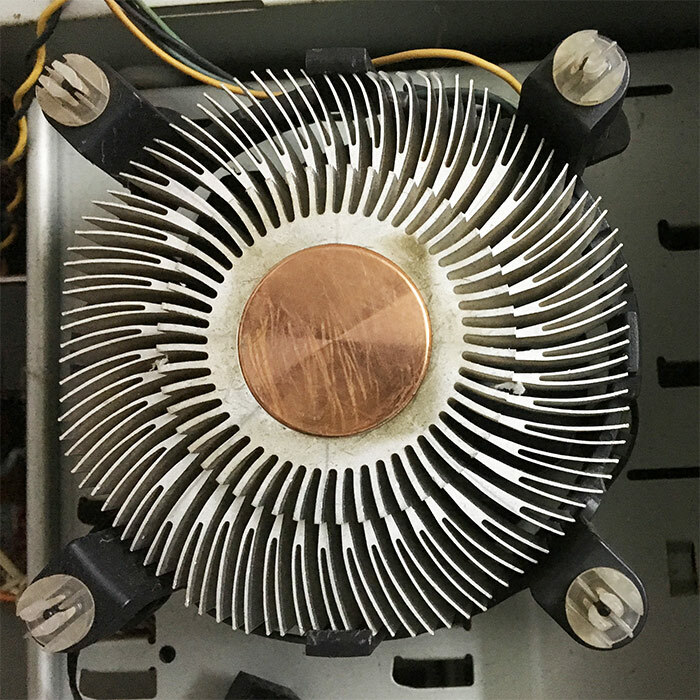 In this case, it continued to edge past 90 degree C.
It was earlier thought that the Heatsink compound between the CPU and the CPU cooler must have dried and rendered useless over a period of time. So we ordered Cooler Master MasterGel Pro high stability thermal compound. When the small package arrived, it is time to open the rig and get down to work. Out came the CPU cooler. The copper mating surface was scrubbed, cleaned and allowed to dry. We used Isopropyl Alcohol for cleaning the Cooler. And then a liberal coat of MasterGel was applied and the cooler refitted. The trusty infra red thermometer was used to check the CPU Cooler assembly temperature. Baseline temperature was about 85.5 degree F (29.7 degree C). Within a couple of minutes of starting the Computer, the CPU cooler temperature rose to 181.4 degree F (83 degree C). The monitor showed almost 95% CPU usage. 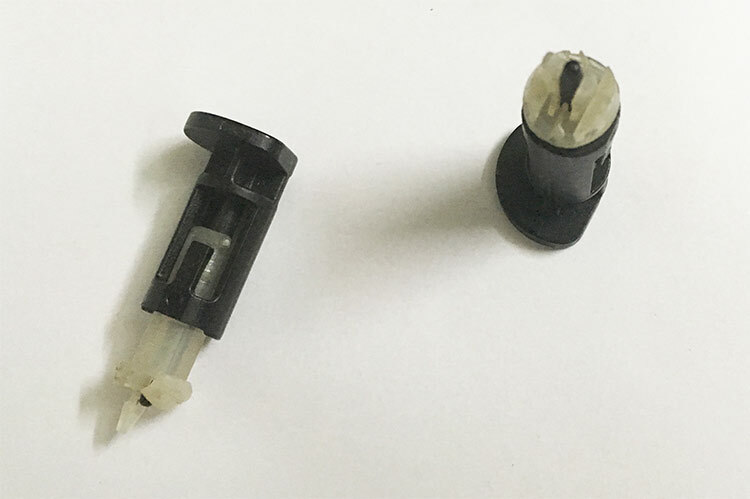 Apparently the cause of excessive heat was not resolved yet by the application of the MasterGel thermal compound. On closer inspection, it turned out that the CPU cooler Push pins had failed to grasp. A new CPU cooler could rectify this issue albeit temporarily until the time came to clean the cooler by removing it. The original Push pins probably were not designed for multiple usage. They would appear as if they grasp well. But the constant fluctuation in the temperature may make them brittle and fail. 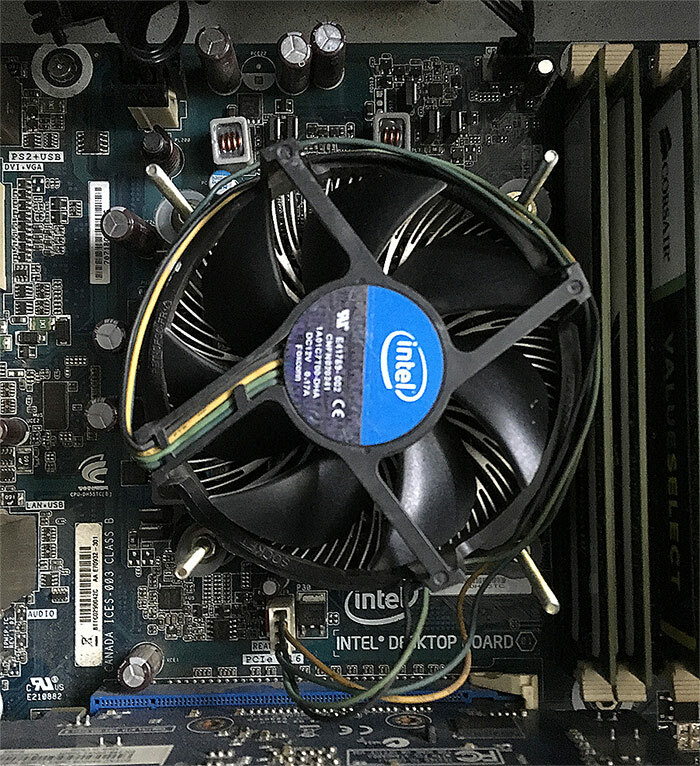 We decided to remove the puny plastic CPU cooler Push Pins and replace it with something that will outlast the CPU. Finally we hit upon the idea of fixing the CPU cooler with 4 long stem screws and nuts. Only problem is to dismantle the mother board to gain access to the back side. 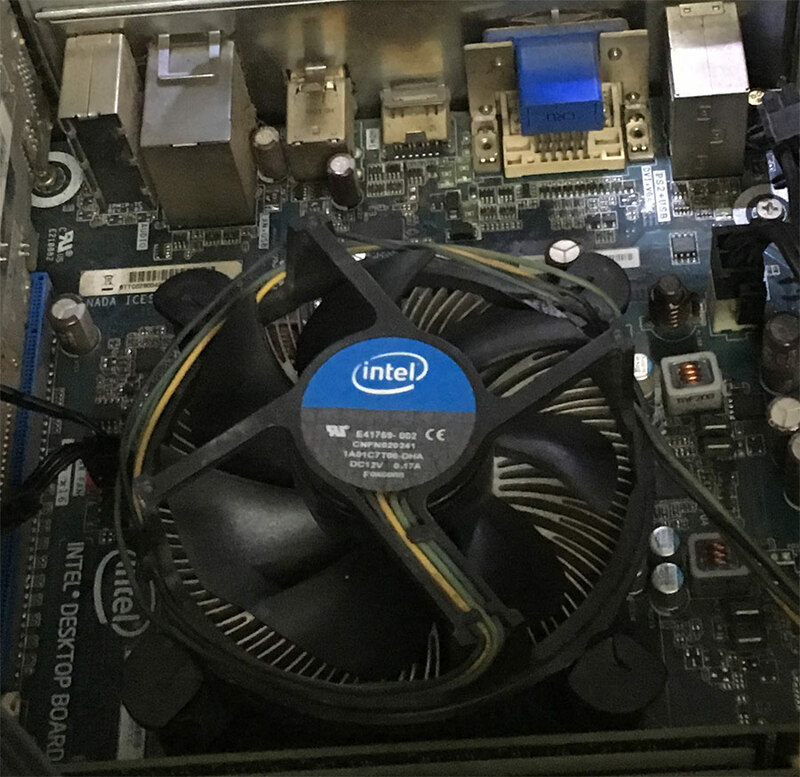 It is a small price to pay for the long time reliability and better cooling of the CPU. We completed the setup with a Cooler Master 12 V fan on the tower cabinet to throw extra air for a better overall lowered cabinet temperature. Before closing the lid finally, the Infra red thermometer was used to check the result of our labor. Sure enough it showed 85.5 degree F for a long time. Inside sensors in the Motherboard seemed to agree with the external thermometer that at 100 % CPU usage, the core temperature didn’t rise beyond 60 degree C (140 degree F). No more random shut down – ever now.